Troy University’s College of Education has recently announced a new after-school learning and tutoring initiative as part of a new partnership with Troy City Schools and AT&T Alabama. The goal of this program is to work with students at Charles Henderson High School and help them find success and stay in school. 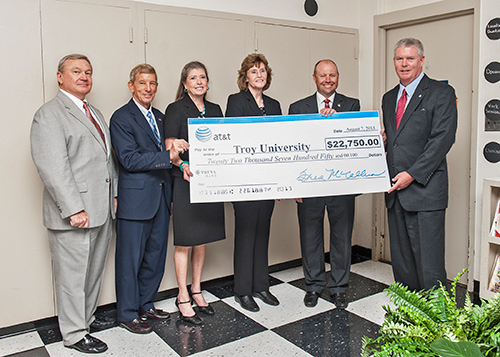 AT&T Alabama officials presented a $22,750 AT&T Aspire Contribution to Troy University to be used to fund the After School Success Program. The Aspire program is one of the largest corporate driven programs of its kind, reaching out to students in danger of dropping out, having helped more than one million students since its launch in 2008. This After School Success Program is set to be officially launched mid-September. Any students that would like to become a part of this program should contact the College of Education for more information. Jobs will be posted online for students to be able to apply for the role of tutors, with three positions being available in the initial offering. Not only will this program work with the ninth and tenth graders of Charles Henderson High School on tutoring math, English and science, it will also be working to help the students look ahead to the future. At regular intervals as part of the programs speakers in various fields from the University will be brought in to discuss their careers with students and help the students learn about the real world applications of what they are learning. Yet another aspect of this program is to work beyond just the classroom. Troy University’s 101 Elite Men are partnering with this program to help provide mentoring and support with a focus on positive behaviors.